Firstly, a little about myself. I was born and bred in Burnley in East Lancashire, and have lived here all my life. Well not quite!. I am married with two children, one of each and two grandchildren, one of each!. My interest is in the history of coal mining, mainly in Lancashire, but also in the U.K. in general, and I also have a keen interest in local history of the Burnley area of Lancashire, England. I am currently working on a 'Chronology of British Coal Mining' a document which now runs to to over four hundred A4 pages. This document now contains at least some information on over four thousand collieries that formerly worked in Great Britain. This might include the closure of an individual pit, when it opened, major developments at the colliery, disasters, and individual accidents to miners. GENERAL ENQUIRIES ARE WELCOME on say the whereabouts of a colliery, or details of pits in Lancashire, or nation-wide. However, searches for individual surnames takes time, for family historians, and all I ask for is a small donation to cover costs of on-going further research and email costs etc. This is only in the event of finding a reference to the name you are seeking. This would be a nominal sum of say five pounds sterling, and could save you years of searching!. My interest in this subject came about through working at Burnley's last deep coal mine, the Hapton Valley Colliery near Burnley in the mid 1960s, and early 1970s. Lancashire has had many coal mining disasters, but the county was not alone in the sufferings of the miners in days long gone. The history of some of the great disasters in coal mining history in the U.K. can be seen on my Coal Mining Disasters Page. Dedicated to the many thousand's of miners' who perished in the collieries of Great Britain, and especially, the Lancashire Coalfield. 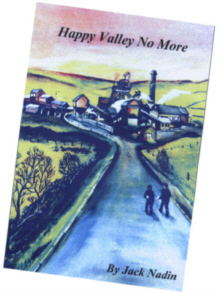 The book all about Hapton Valley Colliery, 'Happy Valley No More' Copies of the book which covers the history of the colliery, including the great disaster there in March 1962, can be ordered through these pages, please email me. The cost of the book, containing over ninety pages and over thirty photos is 6.50p plus 75p. post and package. Or see my contact page for address and telephone number. On the morning of Thursday the 22nd. March 1962, an methane gas explosion tore through the Rise Two District of Hapton Valley Colliery on the outskirts of Burnley in Lancashire. On that day sixteen men were killed outright, and another three were to die later from the effects of the injuries received. This is in addition to the 20 odd who received terrible injuries in the blast. This was the worst colliery disaster in Burnley's long history of coal mining, and for days after the town lay in a numbed shocked state as the effects of the explosion finally sunk in. The areas to feel the greatest effects were the districts to the west of the town, the Accrington Road and Stoops Estate Districts, where most of the men who worked at the pit came from. Time, they say is a great healer, and although the events of that fateful day may be straining to fall silently into the misty cobwebs of time and history, there are still many sad memories of loved ones forever gone they should not be forgotten. A father, a brother or uncle who they will never again see. On the fortieth anniversary of this sad event the history of the pit is recalled to show that time, and the town hasn't forgotten all those who perished, or those who received the injuries, scars and burns on 'Burnley's Blackest Day'. Rekindled also, are the many brave and heroic actions of the rescue teams, the ordinary miners, (and an extraordinary brave woman) who with little thought for their own safety went underground to save those who could be saved, and bring to the surface those beyond help. In true coal mining tradition there was no need for a plea for volunteers that day, men who had just finished their work on the night shift were queuing up, along with others to help their injured comrades. All proceeds from this publication go to the Hapton Valley Colliery Disaster Fund, 'Lest we forget'. This then is the story of 'Happy Valley No More', the last deep coal mine in Burnley. Former miner Jack Nadin and local historian has written book on the mines of East Lancashire in the past, but his latest offering is the only book dedicated to Hapton Valley Colliery and the Disaster. All proceeds will be donated to the Hapton Valley Colliery Disaster Fund. Healthy sales of this book will ensure the continuation of the memorial services for many years to come. IT APPEARS THAT I NOW HAVE TO WRITE ABOUT THE HISTORY OF BANK HALL COLLIERY, BURNLEY'S LARGEST PIT. THIS SHOULD BE OUT IN THE NEXT FEW MONTHS, WATCH THIS SPACE!! The above photo was taken, as I will modestly say, 'some years ago' but its the only one I can find!. I have also made a number of contributions to the local newspaper the Burnley Express, on various subject relating to local history in the Burnley area. If you are interested in the History of the Burnley area of East Lancashire, then visit my other web page at the address below.